Shown below is a set of aggradationally stacked parasequences developed on a tidal flat coastline. Note that on such a coast, subtidal facies are sandy but supratidal facies are muddy. As a result, parasequences are fining upward and flooding surfaces are characterized by mudstone abruptly overlain by thick beds of sandstone. In this case, note the similarity of each of the parasequences and the lack of a clear overall upward trend towards more subtidal or supratidal facies. 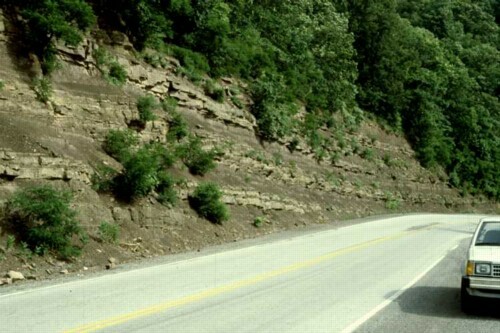 This photograph is from the Upper Ordovician Juniata Formation near Germany Valley, West Virginia. A closeup of these parasequences is presented on another page.